1930 February meeting was held at the home of Mrs Andrew McDonough. Mr. and Mrs. "[J?]" S mason gave a profitable and interesting talk on cigarettes. Told of seeing a sparrow pick a cigarette that hod ben thrown away and fly away with it showing how easily a building might be set on fire and then what an extravagant habit it is as well as injurious Mrs. G.W. Richards read frome the scriptures of holy clenliness of the spirit and we sang together that beautiful song of truth He hideth my sole in the cleft of the rock and covereth me there with his hand $6.00 was allowed Francis Willard and Lillian Steveson. State legislative. $2.75 was allowed for programs Miss Jenny Baily was apointed to make arangements for the window for our annal market day bake sail bill was allowed for flowers a colection of pennies from all members of the state was taken to be presented Mrs. Ida B. "[Wise?]" Smith as a token of love as she jurnied abord in "[forren?]" land Mrs Alden and Mrs. G.W. Richards was apointed to inquire why the law was not observed better in regard to smoking on the school gronds. We ajorned with repeating our benedition Mrs. H.A. Shaw sec Minutes of the march meeting The devotional by Mrs. J.S. Sloaks the lesson taken from "[Nehemiah? 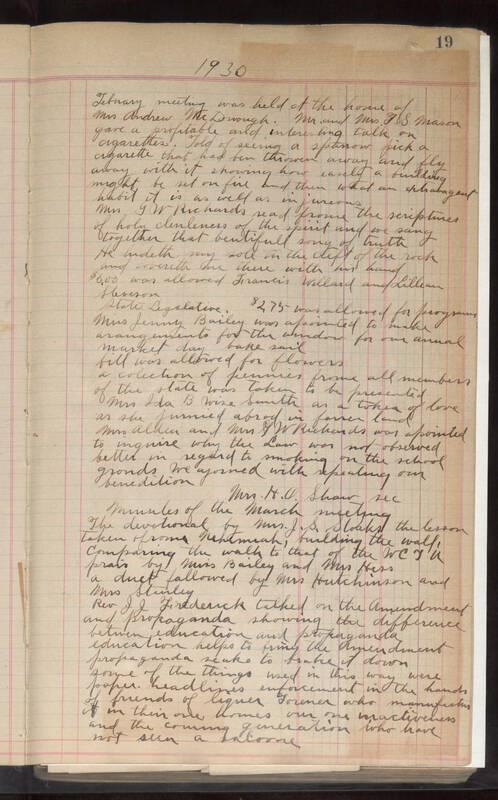 ]", building the wall, comparing the wall to that of the WCTU prais by Miss Bailey and Mrs Hess a duet fallowed by Mrs Hutchinson and Mrs Stanley Rev JJ Frederick talked on the Amendment and propaganda showing the difference betwen education and propaganda education helps to "[bring?]" the Amendment propaganda seaks to brake it down some of the things used in this way were paper headlines enforcement in the hands of friends of liquer Foremen who manufacture it in their "[own?]" homes our "[own?]" inactiveness and the coming generation who have not seen a "[baloone?]"